Mussels, sometimes called "the poor man's oyster," feature glossy dark blue shells and delicately flavored flesh. Rich in protein and minerals and high in beneficial omega-3 fatty acids, mussels can be a healthful dietary choice. However, not everyone can or should eat them. Difficulties in digesting mussels -- indicated by nausea, vomiting and abdominal pain -- can usually be attributed to several types of allergies. Marine toxins in mussels can also cause gastrointestinal and neurological symptoms. Avoid mussels if you suspect you are allergic to them. 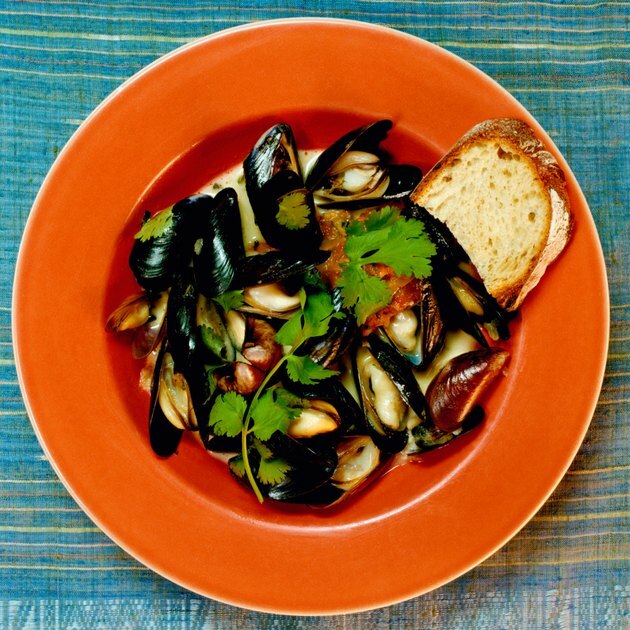 Foregoing mussels during summer months can help you avoid shellfish poisoning. Allergy expert Dr. Anna Feldweg, a clinical instructor at Harvard Medical School, says that the most common type of allergic reaction is caused by your body producing IgE antibodies in response to proteins in the mussels. Although you may experience vomiting and diarrhea, gastrointestinal problems are not the most common symptoms. This type of reaction usually affects your skin and airway, with hives, itching, flushing, wheezing, coughing and tightness in the throat. A rare but life-threatening anaphylactic reaction can occur. If you experience difficulty breathing, swollen lips or tongue, dizziness, fainting, a feeling of impending doom or a rapid pulse after eating mussels, MayoClinic.com advises calling 911. Because it is impossible to predict the severity of the reaction, you must avoid mussels if you have ever shown signs of being allergic to them. A second type of allergy, which features nausea, vomiting and abdominal cramps, can also occur after eating mussels. Unlike an IgE-mediated allergy -- which can occur within several minutes to an hour after eating mussels -- this type of reaction which usually develops within two to four hours. Feldweg notes that there is no risk of airway constriction with this type of allergy. However, there is no prevention or cure for it, and it can't be detected by tests. Even a onetime episode of this type of reaction is cause for avoiding mussels in the future. Reddish-brown microorganisms called dinoflagellates can infect mussels and cause three different types of shellfish poisoning. With paralytic shellfish poisoning, symptoms include numbness and tingling in your face, arms and legs, along with headache, dizziness and nausea. In severe cases, paralytic poisoning can cause respiratory failure and death. Signs of neurotoxic shellfish poisoning include numbness, tingling in the mouth, arms and legs, nausea, vomiting and diarrhea. It is rarely fatal, and recovery usually occurs in two to three days. Amnestic shellfish poisoning, which is very rare, starts with gastrointestinal distress within 24 hours of consumption, and can cause short-term memory loss. If you have signs of shellfish poisoning, seek emergency medical care. The Centers for Disease Control and Prevention notes that about 30 cases of shellfish poisoning are reported every year in the United States; once every four years, shellfish poisoning claims a life. Doctors usually treat shellfish poisoning with medicines to stop vomiting and IV fluids to replace lost electrolytes and fluids. They may also recommend the use of activated charcoals and gastric lavage, also called stomach pumping. According to the "New York Times" Health Guide, the traditional advice of foregoing mussels in months without an "r" is sound. Avoid eating mussels during the summer, and don't eat them if you believe they were harvested in or near a "red tide," which indicates a high population of dinoflagellates. The CDC also warns against eating mussels sold as bait. The University of Maryland Medical Center notes that infants, pregnant women, elderly people and individuals with weakened immune systems are most at risk for shellfish poisoning.